I am super picky about my green beans! Growing up we ate only canned green beans and so the taste of fresh or frozen didn’t really appeal to me. I have tried to like them, but I think its the texture that I don’t like. 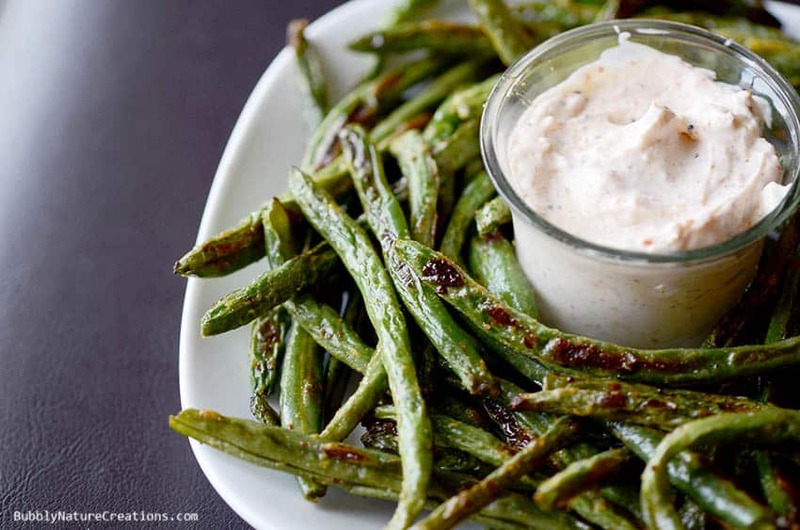 I had never tried roasted green beans until the other day and I was SOOO glad that I did! I knew that roasting made asparagus and other veggies amazing, but I never thought to roast green beans. 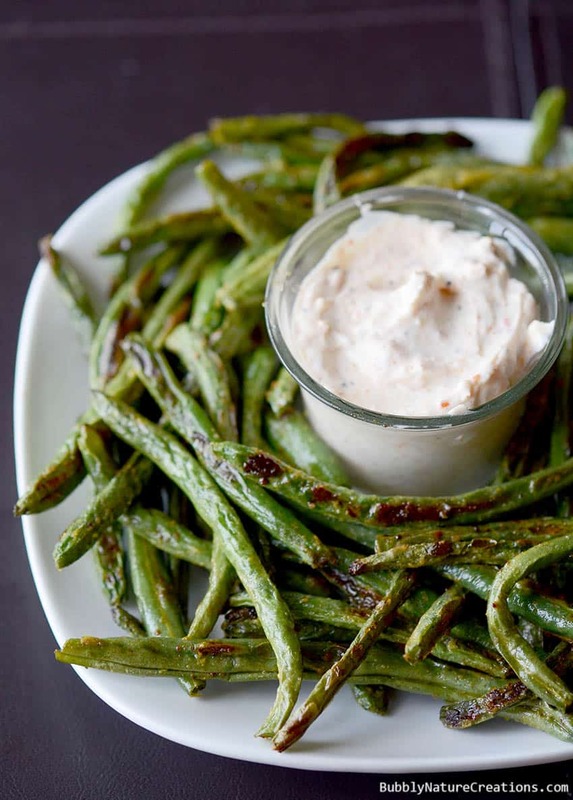 These Roasted Green Bean Fries will now be on our plates weekly… maybe even twice a week now! Combine them with creamy dipping sauce or (low carb) ketchup and you’ll never miss potato fries! My family of 6 downed 2 pounds of these so you may need to make more than the recipe states if your family is like ours! These are so healthy and low calories. 1 pound of fresh green beans is only 141 calories! Add in the oil and you are still well below a large order of french fries! Such an easy and healthy treat! Enjoy! optional 1 Tbsp. Nutritional Yeast adds a unique flavor-really good! Preheat oven to 425. Coat green beans with coconut oil (if not using liquid make sure to melt it) put green beans and oil into a large ziploc bag and shake until the green beans are coated. Add the nutritional yeast to the bag if you are using it and shake until evenly coated. Place green beans onto a baking sheet and sprinkle sea salt over them. Bake for around 25 minutes for fresh green beans and around 40 or more for frozen. Flip once during cooking. The outsides should have spots of dark brown once they are done. Combine the dipping sauce ingredients with a hand-mixer until well-blended. Cover and refrigerate for at least 2 hours before serving. Yum, those green beans look super delicious! Thanks for the recipe, pinning! 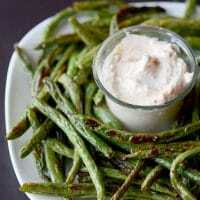 I absolutely LOVE roasted vegetables and your green bean fries sound SO good! Pinning to try this weekend! I have never, ever tried roasting Green Beans! We do aspargus and other veggies, but I’ll have to put this on my list! YUM! Yumm! Used your recipe tonight with asparagus instead of green beans. I was so pumped to try roasting green beans for the first time, but the grocery store was out of fresh looking ones. 🙁 BUT the same recipe with asparagus instead was still a hit! Can’t wait to try it with green beans! Is nutritional yeast the same as baking yeast packets? Hi Leslie. No it’s not. Nutritional yeast is used as a flavor enhancer and has nutritional value as well. You can find it here: http://amzn.to/1xNL6z9 (affiliate link) Of course you do not need it… it’s just a seasoning and salt and pepper work just as well. This looks great! Have you actually used frozen? I wonder if they would crisp up enough. On the 1T Parmesan Cheese in the sauce. Are you using fresh grated or the stuff in the green can? Looking forward to trying this recipe. Did you trim the ends of the green beans first? These were fresh, but in a bag… I think the end were already trimmed if I remember right. These were great! I put some Cajun seasoning on the beans, and cooked them about 10 minutes longer. My husband actually ate them, and he doesn’t do veggies! I made these for dinner one night when a family friend was visiting. He looked at them and told me “I don’t eat vegetables.” After my death stare, he begrudgingly tasted them – and LOVED them! He actually brought fresh green beans the next time we cooked out and asked me to make them again!